The 1981 Argentine Grand Prix was the third round of the 1981 Formula One Season. 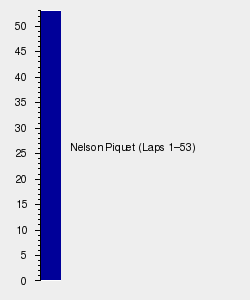 The race was won by Nelson Piquet ahead of Carlos Reutemann and Alain Prost. The race notably being the first podium for future four time world champion, Alain Prost. Following Brazil, there was tension in the Williams camp, neither Alan Jones or Carlos Reutemann were on speaking terms following Reutemann's disobedience in team orders in allowing Jones to take the race victory. The two Williams driver's were now one win apiece and were equal on points for the lead of the championship. Lotus had once again brought its new Lotus 88 chassis to the grand prix and once again the race stewards rejected its legality. Lotus team manager Colin Chapman stormed from the circuit in disgust before the beginning of practice and failed to return for the remainder of the weekend. Jean-Pierre Jabouille had now felt he had sufficiently recovered from his leg injuries sustained at the 1980 Canadian Grand Prix and returned to his Ligier seat for Argentina. Nelson Piquet's controversial Brabham BT49 with its hydro-pneumatic suspension took a convincing pole position at the Argentine circuit. As was typical on the fast circuits, the turbo charged Renault's were competitive with Alain Prost lining up in second with René Arnoux in fifth. Alan Jones qualified third whilst Williams teammate Carlos Reutemann started fourth for his home race. Completing the top ten was Gilles Villeneuve, Keke Rosberg, who had notably impressed again for Fittipaldi, Riccardo Patrese and Elio de Angelis. Jean-Pierre Jabouille's comeback to grand prix racing was not successful, evidently still suffering from his leg injuries he failed to qualify his Ligier, missing the cut with the two Osella's and March's. Jones got a flyer of a start from third on the grid to take the initial lead of the race. However it was soon apparent that Jones's Williams was suffering for pace and before the end of the lap he had dropped behind Piquet and on lap two he fell behind teammate Reutemann. Jones who was down 500 horsepower on his Ford-Cosworth DFV was soon passed by Alain Prost and Héctor Rebaque as well. Buenos Aires, a circuit with long sweeping straights held a reputation as being an engine breaker and on lap three both Didier Pironi and Nigel Mansell toured into the pits with engine troubles. Keke Rosberg could not replicate his strong qualifying performance and came into the pits to retire with fuel feed problems the following lap. Marc Surer would not repeat his Brazilian success and retired with engine problems on lap 14. The competitiveness of the Brabham team was evident in Argentina, Nelson Piquet streaked away in the lead whilst his teammate Héctor Rebaque had overtaken Prost's Renault for third on lap 11. A few laps later on lap 15 Rebaque had overtaken Reutemann for second making it a Brabham 1-2. Rebaque who had never performed so well in his career had his Formula One dream cut short on lap 32 when he retired from the race with a broken distributor arm. From there the race was fairly processional, Piquet took a convincing win in his controversial Brabham chassis whilst behind him Reutemann finished second on home turf whilst Alain Prost took his first podium finish in Formula One. Taking the minor points was Alan Jones in fourth who had survived engine problems throughout the race with René Arnoux in the second Renault fifth whilst Elio de Angelis managed to gain a solitary point for Lotus. After the race Ricardo Zunino was penalized one minute for shortcutting the track after a spin, dropping him from 11th to 13th in the final results.